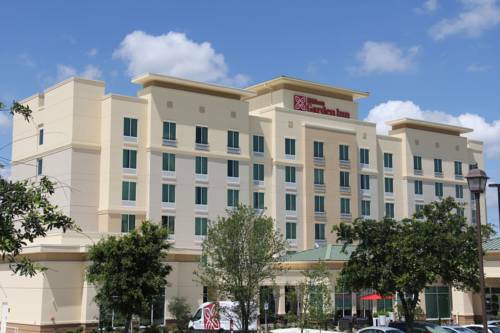 Located in The Rim shopping and entertainment center Hilton Garden Inn San Antonio * The Rim offers easy access to a wealth of shopping dining and entertainment options and is minutes from all that downtown San Antonio has to offer. Take advantage of our complimentary shuttle service to attractions within five-miles of our San Antonio TX hotel. Make yourself at home in a comfortable guest room equipped with a range of modern amenities and complimentary WiFi. Get to work at the desk with ergonomic chair or relax and watch the 48-inch HDTV. Stock up on drinks snacks and microwavable meals from our 24-hour Pavilion Pantry and make use of the in-room microwave and refrigerator. Spread across four meeting rooms our 3154 sq. ft. of flexible event space is the ideal venue for meetings social events and weddings. Let our friendly staff help plan the details ensuring your event is a success. During your stay keep on top of work at the 24-hour business center. Re-energize with a workout in the fitness center or take a refreshing dip in the heated saltwater pool and whirlpool. Enjoy local cuisine in our onsite restaurant which also serves a cooked-to-order breakfast each morning and offers evening room service. The bar is the perfect place to socialize and unwind at the end of a busy day exploring San Antonio. Reservations must be cancelled by 24 hours prior to arrival local time to avoid penalty. Policy is subject to change. ~51 miles from San Antonio.